Jalen Atchico and his cousin, Wayan Bear, sat down to sing outside Fort Peck Community College in Poplar, Montana. Atchico’s deerhide drum, just one of a few he’d made himself, sat in his cousin’s lap. The two whispered to each other in English, discussing which songs they’d like to sing. Atchico, 23, grew up singing traditional Dakota songs and going to ceremonies but rarely could he understand what he was saying. But in contrast to many young people on the Fort Peck Indian Reservation, it’s important for Atchico to know what the words mean. It’s part of his tribal identity, something that was absent from not only his childhood, but from the childhoods of the grandparents that raised him as well. While the duo sang, other students and Poplar residents walking past took note of the performance. It was exactly what Atchico wanted. 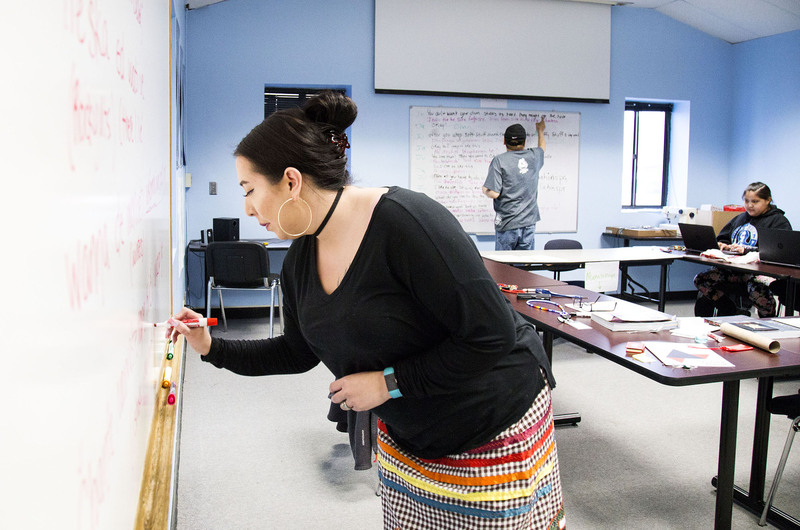 Atchico is one of five students in Voices of Our Ancestors, a program designed to increase Dakota language fluency rates in Sioux communities like those on Fort Peck. The framework and funding for the program comes from the Shakopee Mdewakanton Sioux Community in Minnesota, eastern relatives of the Sioux people on Fort Peck. The Shakopee distributed about $2 million across five Sioux communties for Voices of Our Ancestors. The program was intended to fully immerse each set of students for 40 hours a week in the Dakota language and culture but each location tweaked the program to fit its own needs. Each student receives a stipend for being in the program, and they will attend for two full years, summers included. Andrew Vig, one of the students in the program at the Shakopee location, was one of the main facilitators in the Shakopee community in getting the grant approved. According to Vig, who serves on the Culture and Historic Preservation work group for the Shakopee, an alliance of Sioux tribal colleges had been trying to collaborate on a language revitalization effort for some time, and in 2016 the grant was approved by the Shakopee Business Council. 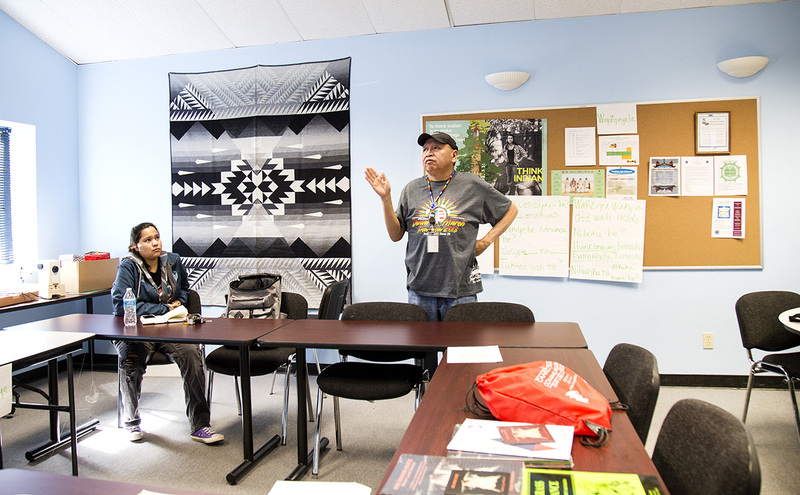 Leslee Bighorn (left) listens as Del First (right) goes over various lessons in Dakota. The Voices of Our Ancestors program is an immersive language program where students spend 40 hours a week studying the language and other cultural traditions. The program started a year later, in the fall of 2017. Armik Mirzayan, a linguist and Lakota professor at the University of South Dakota, said those who attempt to learn and speak Native American languages often face stigma in their communities. From the late 1800s to the 1950s, the United States’ westward expansion hit Dakota-speaking areas. Between boarding schools and laws that made traditional culture illegal, parents quit teaching their kids the traditional language because they didn’t find the language useful, Mirzayan explained. As a result, the children grew up with a negative view of the language, and, to a further extent, their culture. The Dakota on Fort Peck face additional difficulties, because Montana is not traditional Dakota homeland. Mirzayan said Native American languages feel artificial to young people because transitions to 20th century lifestyles have left languages like Dakota behind. Alexx Eagleman-James practices writing introductions on the board in Tuesday night class. The class is working on their full introductions in Dakota for the upcoming language bowl in Minnesota. Eastern and Western Dakota make up part of the Sioux language, which also includes Lakota. “Nowadays, if somebody is speaking Lakota or Dakota, it really stands out,” Mirzayan said. Fort Peck, which is also home to the Assiniboine, has between 25 to 35 fluent Dakota speakers, according to Del First. First is a Dakota language instructor at the community college. He’s taught Dakota for 27 years, though he’s been speaking it fluently his entire life, learning it as his first language at home and translating for his grandparents at stores. 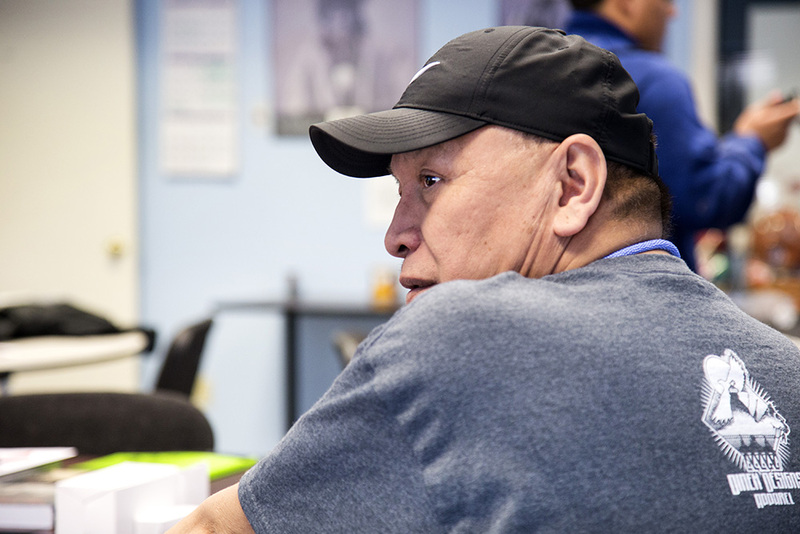 At 56 years old, he’s widely considered the youngest fluent Dakota speaker left on Fort Peck. In his classroom, a long string of signs is stapled to the wall, running the length of the whiteboard. It forms the Dakota alphabet. Other things in the room, like the projector and bulletin board, have labels in Dakota, as well as the four signs on the wall signifying the four seasons. First explains that the alphabet on the wall is written in a new orthography, one that he’s not as used to because it uses H to denote guttural sounds. He turned to reference his class, which is Atchico, Alexx Eagleman-James, Tomecina Escarcega, Justin Gray Hawk Sr., and Leslee Bighorn. All are students at the tribal college. “These guys know the new style,” he said. Gray Hawk Sr. laughed. “I don’t,” he said. Gray Hawk, 38, learned Dakota through song from his father and grandfather, but he said he’s lost a lot since high school. “But they know when I write in old style. They know where to put the marks and slashes,” First said. Since he began teaching Dakota, First said his students have had trouble retaining what they learned after leaving class. He blames it on teaching out of a variety of books. Since the start of this program, he’s all but abandoned books, opting for conversation instead. “We’re not book learners,” he said. Del First, the instructor for the Voices of Our Ancestors program, is the youngest fluent speaker on the reservation. At 56, he hopes he can keep this program on the reservation and continue teaching the younger generation the Dakota language and traditions. First said he teared up after the first skit his students performed. In March, the Fort Peck students took second at a Dakota language competition in Bismarck, North Dakota. They followed up in late April with a first-place finish at a competition in St. Paul, Minnesota. The shorter afternoon class resembles a study hall, with students bouncing technical questions off him as they write skits and practice their introductions. The longer evening session is for conversational Dakota, where the students teach and learn from each other with Del’s guidance. First wishes he could give more time to the program. He works in the tribal government’s enrollment office and since the program is just in its pilot phase, he wasn’t willing to give up his permanent job for one that might not be there later. “As long as we have tribes, I’ll have a job,” he said. First and his students are confident the program will be renewed, and he’ll be able to quit his enrollment job. Wayne Two Bulls, vice president of academics at Fort Peck Community College, said the college decided to build a teacher-training program. 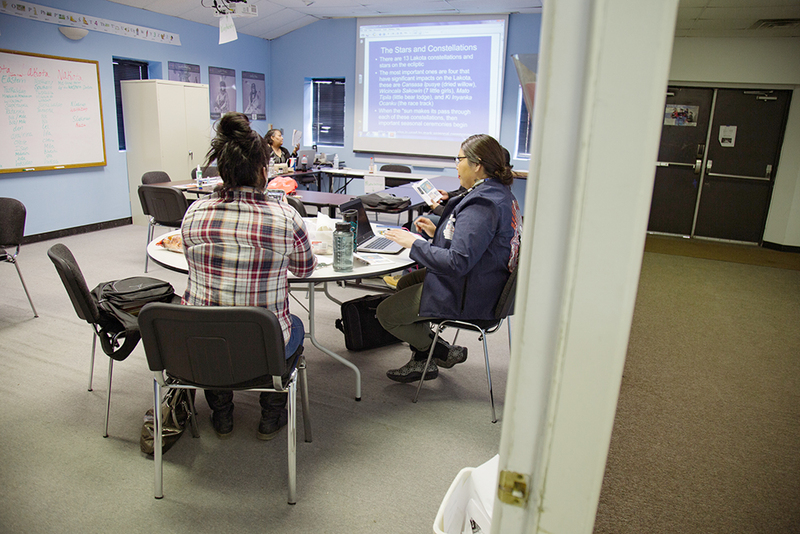 Upon graduation, the students will apply for a Class 7 Native American Educator License. In Montana, a Class 7 license allows anyone to teach a particular Native language in public schools if they are deemed fluent and approved by a tribal council. Once the Voices of Our Ancestors students have their Class 7s, they’ll spend two years teaching in the public schools on the reservation. The five students in First’s class all plan on applying for the Class 7, and First said he thinks they’re ready now, not even a full-year into the program and despite his commitments. “We are way more advanced than the other colleges,” First said. However, learning a second language in the classroom setting has inherent challenges. Tomecina Escarcega, one of the students in First’s class, explained that speaking Dakota is not a trend in Fort Peck’s school-aged children yet. Escarcega practices Dakota with her 9-year-old daughter, Tomeya Brugh, who’s shy about speaking it. “I don’t want people to laugh at me when I do,” Brugh said. Escarcega, who has prior experience teaching Dakota in Poplar Public Schools, said her daughter picks up the language with relative ease. Eagleman-James and Gray Hawk also practice with their children. The ultimate dream the five students share is the opening of a Dakota immersion school on the reservation, but Atchico said the details have yet to be worked out. But even if the dream lacks details, the program still gives the Sioux on Fort Peck more opportunity than the Assiniboine. The Assiniboine and Sioux tribes split the Fort Peck reservation geographically. In general, most of the Sioux population live on the east side of the reservation, in the towns of Poplar, Brockton and Fort Kipp. The relatively smaller Assiniboine population makes up the western side, living in places like Wolf Point and Frazer. The student support services director at the college, Suzanne Turnbull, who is both Assiniboine and Sioux, said historical tensions between the two peoples have always been present. But on the surface, there are efforts to promote both languages and cultures on the reservation. Turnbull pointed out that at the tribal college, which is on the Sioux side of the reservation, the building names are spelled in an Assiniboine dialect, also known as Nakoda. For example, the bookstore, Tikota Tibi, uses the Assiniboine word Tibi instead of the Sioux word Tipi. Even with these efforts, the condition of the Assiniboine language is even more dire than the Dakota. Assiniboine is linguistically related to Dakota and Lakota, but drifted over time. Marty Reum, who is part Assiniboine and works at Fort Peck Community College, thinks there are probably five fluent speakers of Assiniboine left on Fort Peck, and maybe 30 in the world. Unfortunately for the Assinboine on Fort Peck, they have no affluent relatives to help fund a program like the Dakota have in the Shakopee. Del First stands in front of the Fort Peck Community College sign in Poplar, Montana. First is the professor of the Voices of Our Ancestors program, a two year immersive Dakota language program. Reum said the tribal college has applied for grants from the Administration of Native Americans the last three years, but none have been approved. Fluent Dakota elders on the reservation like Nellie Follows The Road-Silk, 86, have doubts that a classroom program can save the language. “They’re teaching it, but I don’t know if it’s going to do any good,” she said. Follows The Road-Silk grew up on Fort Peck and witnessed the language’s disappearance. She recalled one of her great-grandsons who expressed no interest when she tried to speak to him. Atchico agrees. It’s about identity, which he said much of the younger generation lacks because it’s not what’s popular. “We don’t have modern-day words for ‘cell phone,’ or a lot of the technology that we use today,” Atchico said, although the nature of Dakota language allows for new words to be made up. But while Atchico argues that trends in technology contribute to the loss of language, Andrew Vig thinks that formats like Facebook and cell phones allow for the language to grow. Vig also said he’s in Facebook groups that converse in Dakota.